For the health and safety of our patients, visitors and staff, effective January 1, 2013 smoking is not allowed on the Kohala Hospital campus. As a healthcare facility, we strive daily to provide the safest, healthiest environment possible for our employees and patients. Patients are not allowed to leave the hospital to smoke. We encourage all our patients to quit smoking or participate in smoking cessation activities. If you need help or would like more information, ask your doctor or nurse to contact our Respiratory Care Department. Protocols are in place to offer nicotine replacement therapy for patients, if needed. We recognize that smoking and second-hand smoke can be harmful to your health and the health of others. 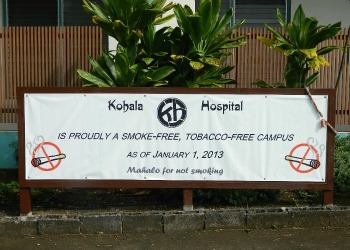 For the health and safety of our patients, visitors and staff, Kohala Hospital maintains a smoke-free environment. Smoking in the hospital facilities, on the sidewalks, roadways, parking lots, and grass areas is prohibited. If you have any questions, please call Administration at (808) 889-6211. Smoking or quitting is personally relevant. Smoking has a lot of negative consequences; for example shortness of breath, worsening of asthma, and decrease in life span. Some of the long term risks are Heart Attack, Stroke and Lung Cancer. These negative consequences are some of the risks not just for the smoker, but include the harm it causes the people around you like your spouse. Your children are also at higher risk for asthma, respiratory infections, and sudden infant death syndrome. Quitting smoking has its rewards, such as a better sense of smell and taste, improved stamina, better self-image, and more money in your pocket. Quitting is not easy. It has many roadblocks like fear of failure, withdrawal symptoms, irritability, and sometimes weight gain, but you are worth the effort. It can be done! Half the people who ever smoked have quit either “cold turkey” (the hard way) or with medication support, counseling classes, or other interventions. They have no regrets. Many people relapse (start smoking again) within the first 3 months after quitting. It’s important not to get discouraged. Remember you get a little smarter every time to try again. Many people who have been able to “stay quit” have done it after trying to quit several times. Certain things or situations can increase you chances of smoking again, such as drinking alcohol, being around other smokers, gaining excess weight, stress, depression, or having more bad moods than usual. Talk to your health care provider to help avoid or deal with these situations. If you want to take charge, call the Hawaii State Tobacco QuitLine at 1(800) QUIT-NOW: 1 (800) 784-8669. A personal tobacco cessation counselor is waiting to help you get started on your journey to a healthier place.